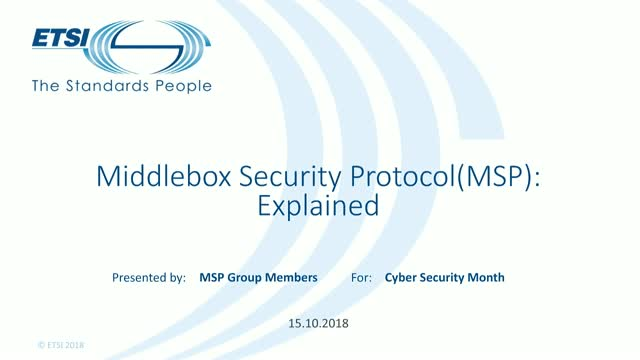 ETSI's new Middlebox Security Protocol (MSP) standards describe a new approach to network security; using middleboxes for layered defence and for management of secure enterprise networks – without infringing user privacy. The MSP standards are designed to protect enterprise networks, facilitating secure management and vital network operations, whilst giving control of user data back to the user. This webinar will describe use cases for MSP, outline projects from the hackathon held on 13 June 2018 and explain the standard for implementers. The webinar will provide a guidance for software developers on how to properly approach architecting and developing applications with components that will run in edge clouds, such as those compliant with ETSI’s MEC standards. This webinar will also offer a live demo on how to use APIs, as suitable tools to use MEC technology, they will also be showcased at the forthcoming MEC Hackathon in September. Jean-Yves Monfort, Vice Chair of the ETSI Committee USER, and Noemie Simoni, expert in the comittee. Two experts from the ETSI Special Committee USER, will present results of their work on future solutions for a new role of users and consequently providers. This presentation, based on the results of two surveys and the analysis of several use cases, introduces a generic model for this new approach. The webinar also introduces the concepts of composition of services and of “as a service”, including the definition of profiles. A special attention has been drawn on security, data protection, privacy and Quality of Experience. Quantum computing will break today’s public key cryptography standards that we use to secure communications today. The ETSI Quantum-Safe Cryptography (QSC) working group is publishing standards that will secure data in a world where quantum computers exist. This webinar will cover the basics of what quantum computing is, how it works and its impacts on currently-used security practices and cryptography. We’ll then cover the industry response to quantum-based security threats and present the landscape of quantum-safe security mechanisms. Attribute Based Encryption (ABE) bundles strong confidentiality with very flexible access control policies. Here, we present the ABE toolkit developed in ETSI TC CYBER through the standards ETSI TS 103 458 and ETSI TS 103 532. This webinar will introduce the challenges related to access control and protection of personal data and describe the ABE toolkit in detail. It will also provide real-world scenarios as example and an outlook on future developments of the toolkit. Hosted by the Chairman of TC CYBER, which is the most security-focused Technical Committee in ETSI, this webinar will cover work, standards and developments in cyber security eco-system. It will address protection of personal data and communications, IoT security and privacy, cyber security for critical infrastructures, enterprise and individual cyber security, cyber security tools to support government activities, forensic activities, direct support to EU Legislation and the Quantum-Safe Cryptography working group. Sami Kekki, Huawei and Fabio Giust, Athonet, active participants of the ETSI MEC ISG. Multi-access Edge Computing (MEC) is one of the key building blocks of 5G and a market driver for current 4G networks. After a short introduction to MEC, this webinar will bring you through ETSI MEC progress and how the industry is using it to build actual commercial products, based on Nokia use case. We will also share how ETSI drives activities to help accelerate market adoption through hackathons, Proofs of Concepts, best practice and informative white papers. Dr. Markus Mueck, Intel, Chairman of ETSI’s technical committee for Reconfigurable Radio Systems (TC RRS). ETSI’s Software Radio Reconfiguration model provides a modular and scalable solution to the challenge of deploying and using software radio systems. The solution, described in a recent ETSI white paper and in the EN 303 146 series of European Standards, allows a gradual and stepwise deployment of software reconfigurable radio, through different generations of equipment. This enables device manufacturers to gradually implement software reconfigurable radios, developing confidence at each step of the way. Dr. Markus Mueck, of Intel, is the chairman of ETSI’s technical committee for Reconfigurable Radio Systems (TC RRS). In this webinar, he will explain in more details the advantages of software radio reconfiguration, and explain how the ETSI Software Radio Reconfiguration model addresses each of the issues identified above. This webinar walks the audience through the main ingredients of the Test Description Language (TDL) standardized at ETSI. It showcases the use of TDL for designing scenario-based test purposes and test descriptions, using examples from test suites standardized at ETSI. An integrated development environment for TDL, developed as part of the TDL Open Source Project (TOP) under the guidance of the ETSI Technical Committee Method for Testing and Specification (TC MTS), will be demonstrated as means to get started with using TDL today. This Webinar will provide a high level overview of ETSI activities on the development of REST APIs for NFV Management and Orchestration, followed by a tutorial on the VNF Package specification that has just been completed. The VNF package specification ETSI GS NFV-SOL 004 defines a standard way for VNF providers to deliver VNFs to service providers and makes the delivery simple, effective and efficient. A uniform VNF package format enables automatic execution of VNF on-boarding and acceptance testing, and allows the VNFs to be interoperable with independently developed NFV management and orchestration systems. The VNF package specification leverages the TOSCA YAML CSAR archive format by adding all necessary integrity and authenticity features. Since 13 June 2016, European Union Member States applied new rules for placing radio equipment on the European market and putting them into service. From 13 June this year, all radio equipment being placed on the market or put into service must comply with the new Radio Equipment Directive (RED), 2014/53/EU. ETSI’s Harmonised Standards are often the preferred method of demonstrating compliance with European radio regulations. This webinar will explain how industry can access the EU market using ETSI Harmonised Standards, provide an update on the status of availability of ETSI’s Harmonised Standards, and indicate alternative paths in the cases where Harmonised Standards are not yet available. Dr. Michael Sharpe is the Director of Spectrum and Equipment Regulation at ETSI. He is responsible for ensuring effective co-operation of ETSI’s technical activities with the work of key regulatory bodies and partner standards bodies at the National, European and Global level. His current priorities include working with the European Commission to ensure the smooth introduction of the Radio Equipment Directive, and the continuing close co-operation with CEPT and the Commission Radio Spectrum Unit to ensure that ETSI Harmonised Standards and Regulations on radio frequency use are developed in a co-ordinated and effective manner. Network Functions Virtualisation holds some particular challenges in the telecommunications space. This webinar will discuss the publications of ETSI NFV Security Working Group and some future work directions. The webinar will be presented by Mike Bursell, Chief Security Architect at Red Hat Inc. Mike is also the vice-chair of ETSI NFV SEC working group. This webinar will summarize recent and current activity in the Testing working group. It will give an overview of pre-deployment testing and conformance testing as well as new work items being worked on now. It will also give an overview of NFV testing activity based in open source projects like OPNFV. This webinar will briefly describe a high level architecture of NFV acceleration technology, including a set of key components and interfaces. We will also introduce the latest release of the ETSI NFV Group Specification for acceleration technology, including use cases, interface requirements, and resource management. We will also give a general overview of the newly approved Work Items about normative specification of acceleration interfaces, along with some thoughts on keeping interaction with other communities for better industry engagement. The speaker is Ning Zong, a Principal Engineer in Network Research at Huawei Technologies. He is also a vice-chair of IFA (Interface and Architecture) WG in ETSI ISG NFV. As urbanization continues, cities need to become smarter, which includes leveraging information systems for improving the safety and wellbeing of their citizens. Many of these systems rely on extensive deployment of distributed sensors. These sensors generate large amounts data which calls - in particular in the context of public safety - for efficient real-time processing strategies in order to detect incidents as quickly as possible for initiating appropriate counter actions. Also, sensor data handling is typically governed by tight requirements for data privacy, meaning that data needs to be appropriately protected and cannot be carried outside of the city perimeter. Video Analytics is an end to end use case for providing video surveillance to cities, municipalities, and enterprises over an LTE network. Mobile Edge Computing (MEC) is used for analysing raw video streams from surveillance cameras connected over LTE, and for forwarding relevant incidents to the local control room. This use case benefits from MEC which provides analysis capacity close to the network edge, as well as local break-out of network traffic. This saves video transmission bandwidth, as a lot of processing can take place close to the point of capture to reduce the amount of data forwarded, and local break out allows to consume locally-produced high volume data locally without routing them through larger parts of the network. Nokia, Vodafone Hutchison Australia and SeeTec have run a MEC proof of concept (PoC) during the Informa MEC congress in Munich. As use cases, the classification / counting of people, and the tracking of object presence/absence were demonstrated. This webinar describes the architecture of the PoC, presents the demonstrated use cases and discusses the findings of the PoC. This webinar will provide an introduction to the Interfaces and Architecture (IFA) Working Group (WG) in ETSI NFV. It will describe the ETSI NFV architecture, functional requirements, information models and descriptors being standardized by the IFA WG. Special emphasis will be given to the recently published specifications on VIM northbound interfaces (IFA005, IFA006). It will also give an overview of the 2016-2017 IFA WG work plan. The speaker is Dr. Raquel Morera, chair of the IFA Working Group in ETSI NFV. Raquel is an Associate Fellow at Verizon. She has pioneered much of the work on SDN and NFV from conception, deployment and standardization. She helped establish the ETSI NFV MANO WG, which she co-chaired until it closed. ETSI NFV ISG is in the final stage of publishing all of its Release 2 Specifications and Reports. This webinar highlights some of the fantastic Release 2 results and introduces the upcoming Release 3 work program. Watch this webinar to get the most up-to-date plans from the NFV community and see what's coming up on the horizon. The speaker is Thinh Nguyenphu, NFV Architect at Nokia Bell Labs. Thinh is chairman of the ETSI NFV ISG Evolution and Ecosystem Working Group (EVE WG) and vice-chairman of the Solution WG, and member of the NFV Technical Steering Committee. Service assurance accurately measures and reports on infrastructure (network and platform) KPIs that might affect a specific service. Although service assurance is well-understood in the traditional networking environment, applying a similar mechanism to network functions virtualisation infrastructure (NFV-I), and using principles from software-defined networking (SDN) to automatically restore service level remains a work in progress. Telenor, Brocade, Creanord, and Intel have partnered together to develop an approach to Virtual Service Assurance Management (vSAM), enabling more open and deterministic service deployment and resource usage in a virtual environment. Tim Epkes is a Principal Software Engineer at Brocade under the CTO for Mobility, working on open-source software development and solutions prototyping. Tim collaborates with partners and customers to create software that accelerates adoption of software solutions like SDN and NFV through further automation. Antti Pappila is a co-founder and CTO of Creanord focusing on innovation, Creanord's long term roadmap and strategic partnerships. Antti is an Industry visionary with extensive experience in Performance Assurance, SLA Monitoring & Networks developed through close collaboration with the leading service providers and network vendors worldwide. Brendan Ryan is a senior software engineer in the Communications Infrastructure Division at Intel, working on open-source software development and customer enablement towards adoption of SDN and NFV technologies in telecoms networks. This webinar introduces the security model in ETSI's Software Reconfiguration Framework for Mobile Devices. It gives an overview of radio application distribution scenarios and related risks, describes how the model supports the regulatory framework for radio equipment exemplified by the declaration of conformity, and details the measures in place for the protection of assets.